Kalbolsky’s Lost Artifacts is a small museum, which resides in the uptown area of Chicago.Doctor Kalbolsky and his associate Seth Dobbs, the proprietors of the museum, aide countries from around the world by excavating and restoring their priceless artifacts from the past, in exchange, the museum is consigned with many relics for display, providing a comfortable living. Their comfortable lifestyle soon turns into an unimaginable horror, as an ancient Egyptian statue called the Anubis…custodian of the underworld, is delivered to their museum possessing the soul of an evil pharaoh from the days of Moses. 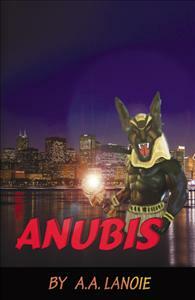 The Anubis unleashes the wickedness of the underworld upon the “Windy City”, releasing terror on all humankind. Unknowingly, Doctor Kalbolsky is the only one who holds the key that could stop the creature…that’s if it is not already too late! I love this kind of story. Great book, can't wait for the next one. What a refreshing tale of terror! The story takes you by compelling strokes! A must read! I Can't wait to read what A. A. Lanoie might have in store next! This is a great book. A blast from the past and a leap into the future. I could not put the book down. Great SCI-FI. This was a great story! A very entertaining read. Can't wait for the next from this author! A book that will keep your interest, for a new writer great potiential, can't wait to see what else he comes up with! I really enjoyed reading your book. It held my interest all the way thru, and kept my capitivated. I couldn't hardly put the book down, because I wanted to know what was going to happen next. A great sci-fi and horror book. I would recommend this book for everyone to read, especially if you like sci-fi & horror books. I was really happy to read this book. Couldn't put the book down until I was finished. I hope to read more books from this fabulous author. Thanks for the very impressive read! 5 stars!! !